From 21 November 2018 until 5 May 2019, the ADAM-Brussels Design Museum presents Night Fever: Designing Club Culture 1960–Today. 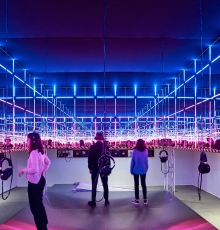 The multidisciplinary exhibition offers the first large-scale examination of the relationship between club culture and design and shows rare and previously unseen objects. A thrilling journey into the nightlife and clubbing scene from the post-war period until today.